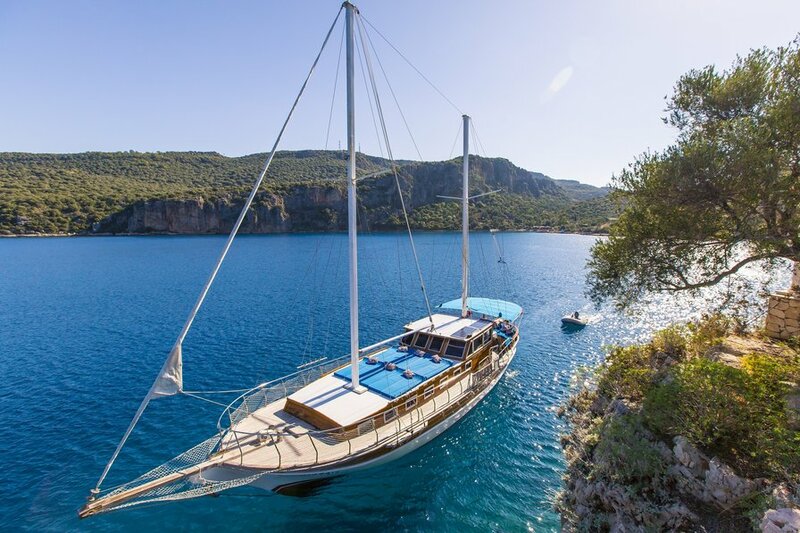 I am owner and captain of the gulet Dilara-1 my gulet 17 meter gulet with four double cabins for guests (and separate crew cabin) and does daily tours to the Islands around Kas, to Kekova for day or longer trips and the areas surrounding Kas. Cabins feature private bathrooms with normal toilets, sink and shower with hot water. The gulet has 2 masts, 145 hp Ford motor, 3000 lt water capacity, 1000 lt fuel capacity, indoor lounge, kitchen, outdoor dining area, sun deck and sun cushions. My gulet has all required navigation equipment such as GPS, VHF Radio, wi fi internet, ipod player,mobile phone and also music/ CD player, life jackets, fire extinguisher, deep freeze, joker boat with outboard,canoe, generator. There is generally snorkeling and fishing equipment available on the gulet.I speaks English, is a native of the area and can help you enjoy a wonderful relaxing time cruising the Mediterranean and Kekova Island area. Generally a crew of 2 is provided on my gulet. Sailing license and travel agency costs. Free use of devices in vessel.